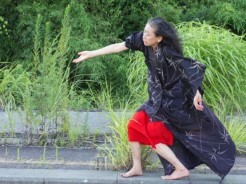 October 4 and 5, 2015, Eiko performed three times on each day at the Alsop House of the Davison Art Center at Wesleyan University. 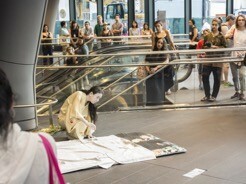 Each performance was followed by a short discussion with the audience. The intimate solos requested small audiences, who were then led throughout the space, inside and out, in the daytime and nighttime. 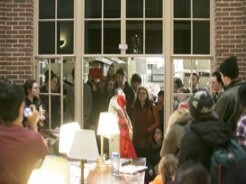 This was a continuation of her A Body in Places experimentation this fall at Wesleyan University. "I see a woman in mourning. Mourning herself? I’m standing outside the window of a room looking in. She looks so vulnerable. There are so many of us and one small her, a dynamic that feels accidentally violent. As I have many times this semester, I feel like I am seeing something I shouldn’t be seeing. As we’re led into the hallways, I feel a distinct sense of foreboding. I tell myself how silly it is, but the feeling holds tight to me. It’s the same way I feel entering a haunted house; I am about to see a ghost. We enter the room and she has not moved. I am relieved because it is good to keep a dangerous thing in your sights. How can I find a sight so delicate and so threatening at the same time? I’m filled with an all-encompassing anticipation. There is an event in the air, it is faceless and I wonder if everyone is as afraid as I am. 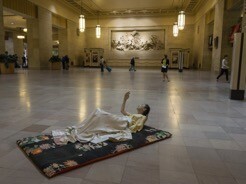 What I think Eiko provided us with was a rare opportunity to live in The Moment Before. In most cases, it is only after an event has happened that we look back and recognize the magnitude of that moment before it all changed. 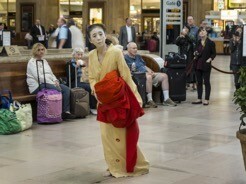 During Eiko’s performance, I felt like I got to milk that moment: the sorrow of loss, the possibility of renewal, the tension of holding on and letting go at the same time. As Eiko began to dig against the floor with her red cloth, starting slowly and building with time, I felt like she was surveying the ground. She wanted to cover as much as she could, to take it all in. I had this sense that she knew she would soon lose it all and wanted to store it, to experience it to the greatest extent that her energy would allow. When she held the bowl filled with water, positioned perfectly at the tipping point between spilling and remaining contained, I felt my anxiety mount again. But when she actually spilled the water on the floor, I felt fine. We can only worry about things up until the point that they are no longer in our control. And then there it was: the scream. Or the noise? It was something primal and shocking, and so perfectly timed. At the exact moment that the mutual anticipation of the crowd had mounted to climax, as we leaned in our bodies and Eiko leaned back her head, the noise erupted and took up the whole space. Following the first were smaller sounds, almost apologetic, not whimpers, but imploring, and in those few moments I felt like I watched a whole conflict play out within me. I was frightened, almost angered, by the sound, followed almost immediately by a sense of sympathy, the kind that you feel when you must punish a small child. I felt like it was just another way for her to explore the peculiarities of the space. [...] The other day in class, I was doodling a fruit, and I remembered how in art class we are taught never to draw simple black outlines. Nothing ever really has a line around it. Things are defined by the space around them gradually dissolving into their bodies, their forms, the way the light shapes them. Watching Eiko take different forms against the white wall of the gallery, I thought about how each movement created a whole different space around her. When she left at the end, I genuinely did feel for a second that I would never see her again. Although I was deeply saddened by this, I felt that she left in peace." 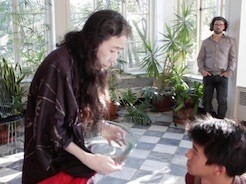 "The word reappearing in my mind when I was watching Eiko through the windows perform was: Entschleunigung. Unfortunately I have not found a satisfying English translation for it. Deceleration comes close, but it was rather the absence of time than its slowdown that struck me. Watching Eiko through the window the boundaries of her “house” seemed to become fluid. The noises of cars driving by, the wind shaking the leaves, seemed to be increasingly detached from the scenery that I became part of. Although we were facing walls and windows, something in Eiko’s presence and movement extended the house so that her audience was at its boundary, neither in the house nor completely part of the outside world. Or perhaps, the audience was drawn into the house by the focus on the movement… This reminded me of the fluid extensions of bodies that we discussed in class. Where are the boundaries of a body? And, who do we allow to cross these and enter to what extend? The way that the audience assembled in the rooms across the house, tightly leaning against walls, made me think of invaders of a private space. Simultaneously drawn into the intimacy of the moment and uncomfortably misplaced. (w/r/t outdoors part of performance) [...] It is a tangible thing, the body. And still, Eiko’s little violations to the different rooms made me think that violations to the body as well may at times be necessary to acquire a new “house”, “body”, and “home”?!"